GCA Altium acted as exclusive financial advisor to Bowmark Capital on its investment in specialist student accommodation WiFi, broadband and internet services provider ASK4. Founded in Sheffield in 2000 by CEO Jonathan Burrows, ASK4 partners with universities, private sector student accommodation providers, residential apartment developers, and businesses, to provide high speed internet solutions and managed data services for multi-tenant accommodation. ASK4 currently serves over 160,000 customers across 400+ sites in the UK and Europe. The business has maintained strong growth with its highly differentiated proposition, focus on customer service, and increasing levels of investment in multi-tenant accommodation. 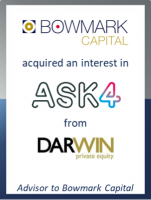 Bowmark Capital is acquiring its interest from ASK4’s previous institutional investor, Darwin Private Equity, and is investing alongside the current management team in support of the company’s continued expansion in the UK and overseas. It will also help to accelerate the roll-out of new products and services, as well as the recruitment and training of additional staff, which will underpin the continued delivery of ASK4’s first class customer service. James Craven, Managing Director at GCA Altium, said: "It has been a pleasure to work with Bowmark Capital on this transaction. ASK4 is an exceptionally high-quality business which is a market leader. The deal represents another GCA deal in the Managed Services & Telecoms sector having recently advised on deals involving CableCom, Luminati, Giacom, Node4 and M247."